This stew is a real winner. Even though the weather is heating up you shouldn't shy away from making it. It's got the trendy member quinoa in there, along with chicken, and some chickpeas and olives that add a nice fresh taste. I made this over a month ago and again this weekend for company. 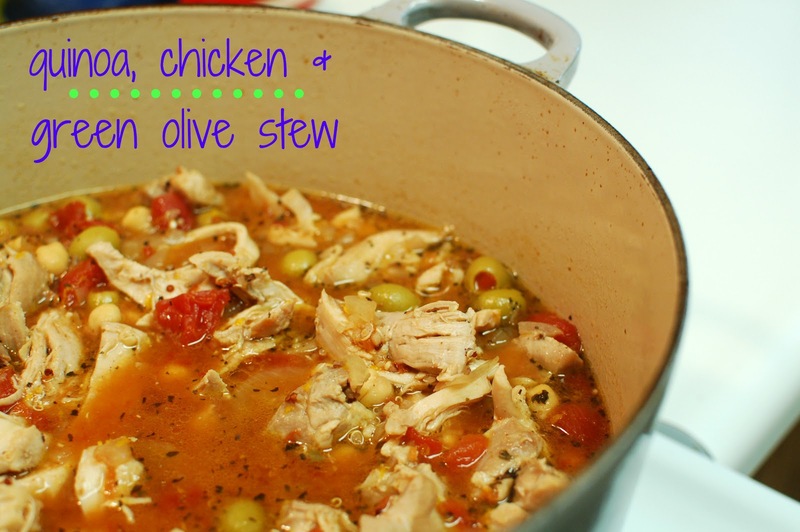 It comes together fairly quickly and if you need to make it ahead of time you can make everything up until adding the olives and chickpeas before you're heating it up again so they don't get too soft. Vegetarian? You can easily make this without the chicken and thanks to the quinoa and chickpeas in there you'll still get all the protein you need. Bring broth to a simmer and add in the chicken. Cook until done, about 15-20 minutes. Remove the chicken and shred it. Meanwhile pour the broth into a bowl and then either skim off the fat or pour the liquid into a fat separator. In the same pot add the oil and onion and cook until softened, seasoning with the salt. Stir in the cumin, coriander, and basil then add in the garlic. After about a minute add in the chile powder and cayenne (adding less cayenne if you don't like a bit of heat), tomatoes, reserved broth, orange zest, and quinoa. Reduce heat to simmer, cover, and cook for 10-15 minutes to cook the quinoa. Now add in the chicken, chickpeas, and olives and heat through then enjoy!